This contemporary two piece sectional with a designated chaise lounge spot is a perfect way to create a fresh feel in your living room. 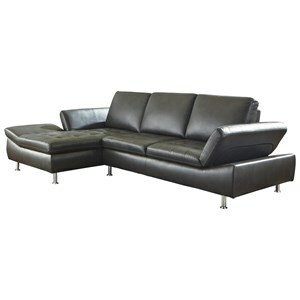 The back is hinged to allow for positioning adjustments, adding to both the functionality and comfort of this sectional. The sleek contemporary look of this piece is a great way to add a modern yet relaxed vibe to your home. The Carrnew Contemporary 2 Piece Sectional with Chaise by Signature Design by Ashley at VanDrie Home Furnishings in the Cadillac, Traverse City, Big Rapids, Houghton Lake and Northern Michigan area. Product availability may vary. Contact us for the most current availability on this product. 3720656 RAF Loveseat 1 41.5" 61.5" 36"
3720616 LAF Corner Chaise 1 70.5" 36" 36"
Browse other items in the Carrnew collection from VanDrie Home Furnishings in the Cadillac, Traverse City, Big Rapids, Houghton Lake and Northern Michigan area.